Views allow you to access data in ways other than the the presentation of your existing data source. Views use the same underlying resource but are accessed differently in TextConverter and TARGET Reports. In TextConverter, to edit a view, click on the script tab (next to preview options), add a variable that is a DB (right click in the variable column, choose Data Properties, choose DB), double click on the DB variable (or right click and choose properties). Now choose the view tab. In TARGET Reports, click the browsing icon Then click the suma icon and finally, select the View tab. 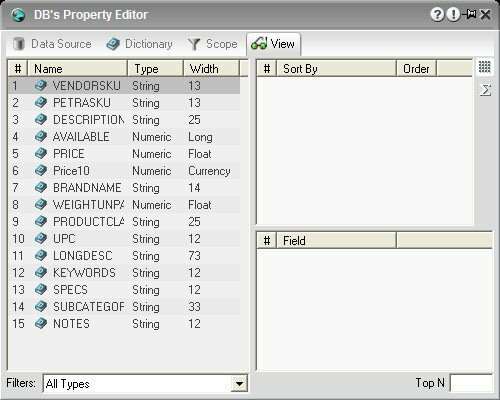 If you wish to use a view while scripting, add a data object, double click on the data object, and select the View tab.